​Our most popular model is the 6x8 slope front, decorative design with stain, and we can get you one installed within 50 miles of our dealerships for $2,700.00. The price may be slightly higher to put one in if you are more than 50 miles away, but it will still be very reasonable. Let us get you a quote for your location or if you want a larger sloped front we have those available as well. To view our brochure and blog post click here. 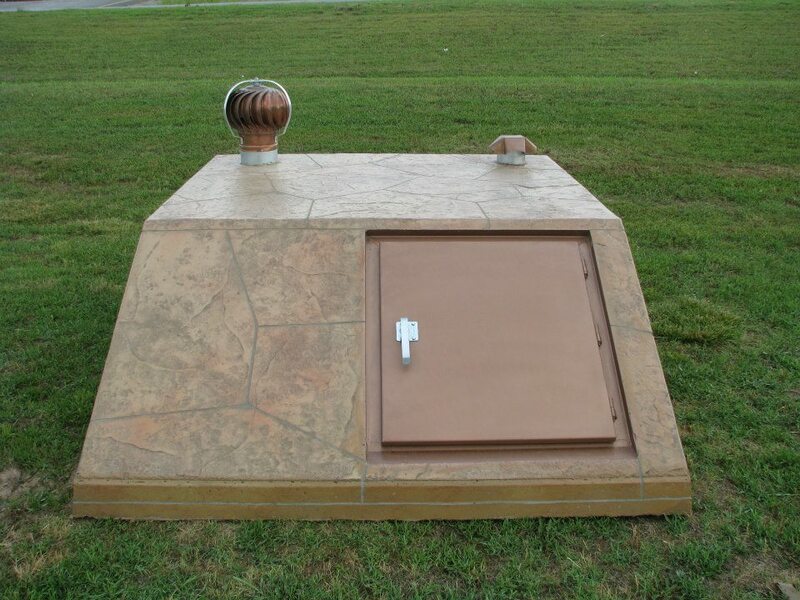 Slope Front Shelters are a great choice for tornado safety. However, be sure you have the proper clearance to allow the truck dropping off the shelter to the area you are installing the shelter. See the illustration for more information. Has concrete stairs instead of ladder get a hand rail for $50.00 or two for $100.00. ​Add $200 for decorative print and stain, otherwise bare concrete look. On larger 6'8"X10 slope or flat models add $400.00. 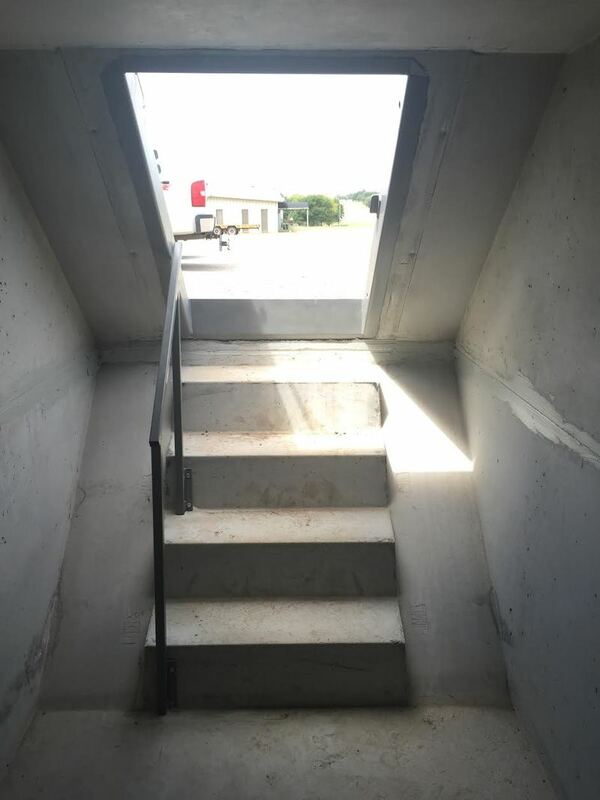 Hand rails on Easy Access $50.00 each additional if desired. 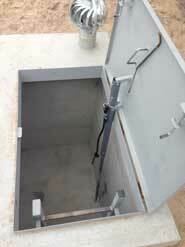 Hausner’s Steel Drop-In Prices--Installed in garage floor or other concrete floor. Flat Top Shelters are essentially the same as the slope front, but some people find them more attractive and less obtrusive, since they don't stick up as much after installation. Clearance needed by the trucks for these shelters is similar to the slope front unit. 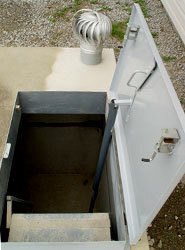 All Hausner’s storm shelters meet FEMA 320, 361 and ICC 500 protocol. 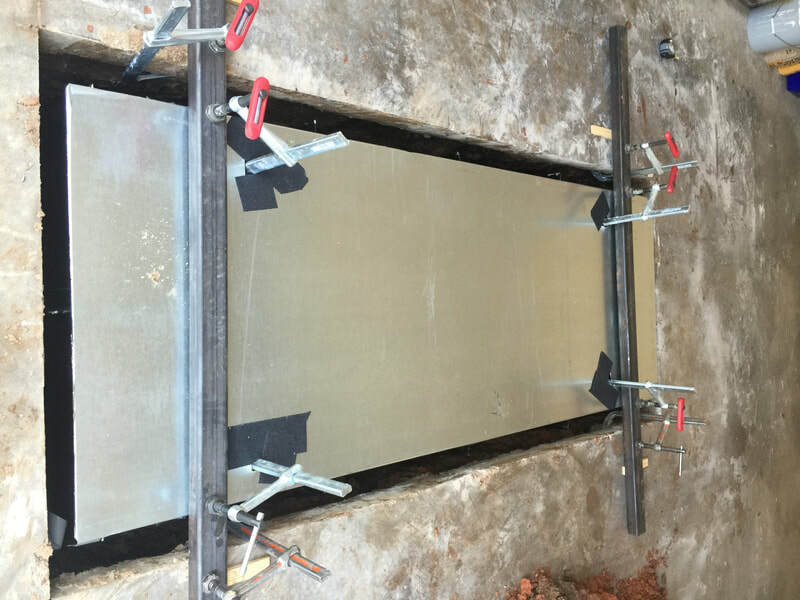 building safe, affordable shelters; and our number one goal is satisfied customers. ties and stone are used in interesting ways. 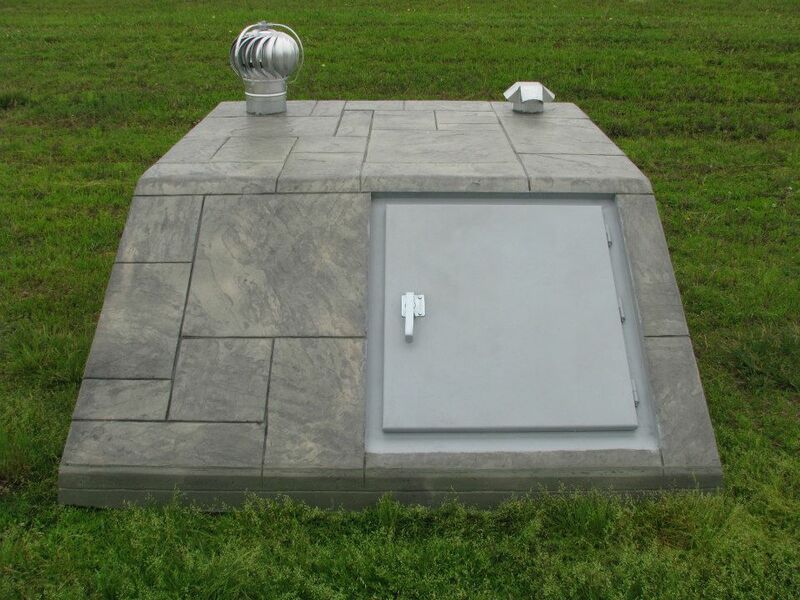 Our storm shelters are designed and constructed with your protection in mind. minimum of 6,000 psi concrete; a normal driveway has 3000-4000 psi concrete. The small storm shelter can be carried in with a backhoe. the unit according to the contractor or homeowner specifications. of width and 13 1/2' of clearance. (1/10) of a mile in order for us to get OKIE to mark the proposed shelter location. Click the "dowload file" link below to download our complete brochure in PDF format. M&D Enterprises is very excited to offer some of the best Storm Shelters and Safe Rooms in the industry. 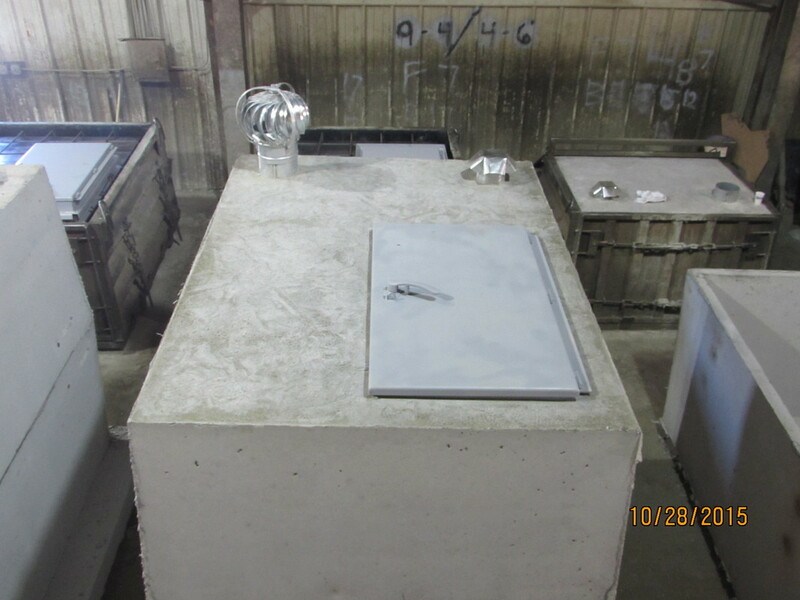 These structures are manufactured by one of the oldest names in the business. Hausner's Inc. has been in business since 1954 and has become a highly trusted name. Their quality products at reasonable prices fit right in with the M&D business plan. 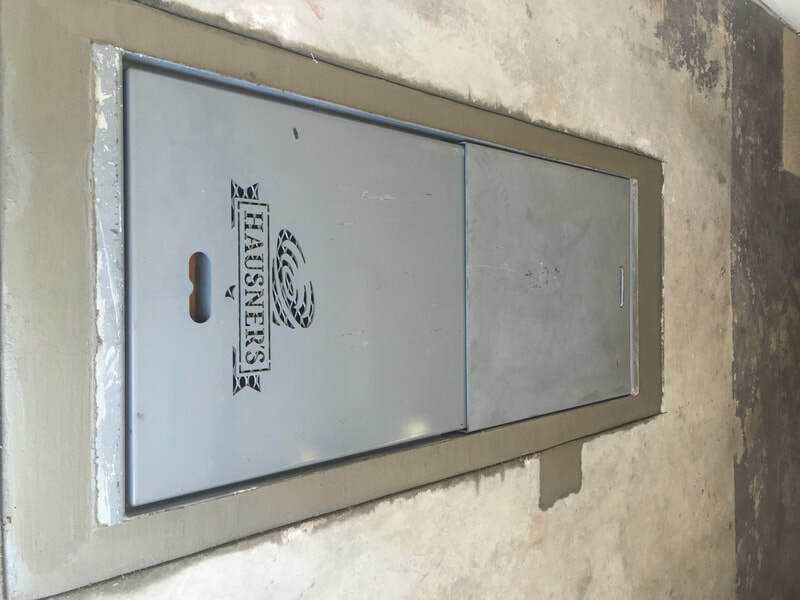 We sell these products delivered and installed by the professionals at Hausner's Inc. so there is no additional hassle to you the customer. 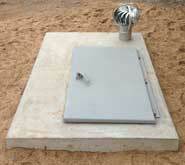 Our 6x8 slope front shelters start at $2700.00 installed depending on your area. Let us get you a quote for your exact location and type of shelter you desire.